Eccentric viewing has been described by some low vision specialists as the most important tool for someone with macular degeneration. If you have been diagnosed with macular degeneration and have done some research, you probably know that what is affected is your central or straight ahead vision, not your peripheral or side vision. The AMD patient experiences a blind or blurry spot in the center of their vision when they look straight ahead. Letters or words disappear across the page or people's faces become unrecognizable. This blind or blurry spot, called a scotoma , is the result of the cone cells dying. These cone cells are located in the fovea the center of the macula, and are responsible for our sharp and detailed vision and what we see in front of us. How Does It Help My Vision? This technique helps adults and children maximize their vision through learning to view objects with their peripheral vision. Eccentric viewing training teaches a person to look slightly to the side so that the blind spot or scotoma is not in their central field of vision. One author describes it as "not looking at what you want to see." It is sometime called preferred retinal locus (PRL) because the person is learning to develop a new or "pseudofovea." With this training the patient must learn to control their eye movement and place the object of interest on a particular location of the retina. The specialist helps people find the peripheral part of the retina where the tissue is healthy and where they can see or focus the best.This might mean having to look slightly above, below, or to one side of a word to focus on it most clearly. Learning the technique requires dedication and concentration. "You have to re-educate your brain to read differently, and your eyes to look differently," says Richard Elliott. The Macular Society in the U.K. uses trained volunteers to teach those with macular degeneration how to maximize their vision by using the healthiest part of their retina. Pepi Noble, who has low vision due to AMD and a macular pucker tells of her experience receiving eccentric viewing training. "I participated in the structured 5 week therapy which included exercises to help me detect the best position to direct my eyes. Although it feels a little unfamiliar at first, within a day or two I was able to use the lower portion of my eyes to read newspapers and magazine without additional light or magnification. And as the weeks went by even driving became easier as did computer usage. I also learned more about safety in and out of the home, tips and ideas that make daily tasks much easier, more about protection from glare, better lighting and so much more. The therapy was covered by my insurance plan with a co-pay as the only out-of-pocket. Participating in this therapy was one of the most productive things I’ve done. It brought me comfort and confidence and reduced stress." Eccentric viewing training is usually offered by a low vision rehab specialist. Most people have the best success and less frustration with the help of several sessions. You can ask your eye doctor, a low vision specialist or a rehab center on where to access training. 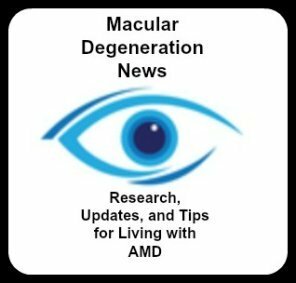 One author (who did not identify herself) summed up the importance of this technique by saying,"How well you learn Eccentric Viewing will define just how disabling Macular Degeneration will be in your life."